miniOrange provides a ready to use solution for Wordpress. This solution ensures that you are ready to roll out secure access to your Wordpress site using Google Apps within minutes. Go to https://admin.google.com and login to your Google Apps Administrator account. On the Admin Home, select More Controls Apps. In the App Settings, select SAML apps. Click on the "+" button at the bottom right corner to create a new SAML app. Now select SETUP MY OWN CUSTOM APP from the popup. On the next screen, note down the SSO URL, Entity ID URLs and download the certificate. These will be required while configuring the Plugin. Once you have noted the URLs and downloaded the certificate, click on Next. Enter the Application Name and Description. Click on Next. 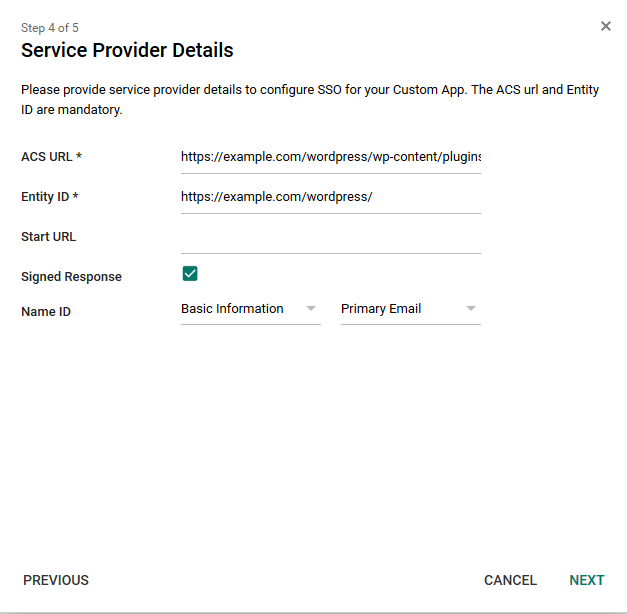 ACS URL ACS (Assertion Consumer Service) URL from Step1 of the plugin under Identity Provider Tab. Entity ID SP-EntityID / Issuer from Step1 of the plugin under Identity Provider Tab. Name ID Select Basic Information from the first dropdown. Then Primary Email from the second dropdown. Click on Next. Then click on Finish. Now go to SAML Apps again. Click on the menu link corresponding to your app (See the screenshot). Then select ON for everyone. From the popup, Click on TURN ON FOR EVERYONE. 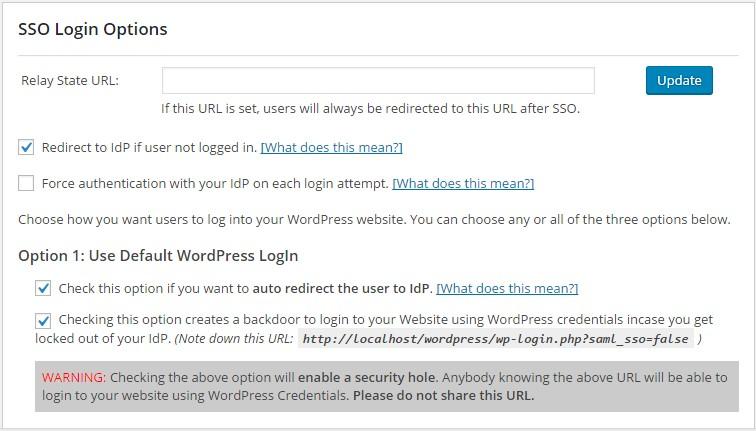 SAML Login URL: The SSO URL that you noted while configuring the Wordpress site in Google Apps. IdP Entity ID or Issuer: The Entity ID that you noted while configuring the Wordpress site in Google Apps. X.509 Certificate: Open the downloaded certificate in the Notepad. Copy/paste the entire content of the file here.